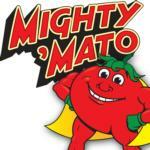 Mighty ‘Mato® claims its grafted tomatoes are stronger, more vigorous producers, and more resistant to pests and diseases than regular tomato plants. “Super plants” are how grafted tomatoes should be described. By grafting onto a rootstock variety that has superior vigor and disease resistance with a variety that is well known for flavor or sweetness, you now have a plant with the best characteristics of both varieties. To see if these claims are true, we obtained a grafted ‘Pineapple’ heirloom tomato plant and a conventional ‘Pineapple’ heirloom tomato plant from Territorial Seed Company and grew them side-by-side at the FOHC vegetable garden during the summer of 2013 to see how they performed. The grafting rootstock was SuperNatural® rootstock, seeds for which are also available from Territorial Seed Company. Both plants were transplanted into the ground on April 24, 2013 and removed on September 4, 2013. Grafted tomato plants should not be planted deeply as is usually recommended for tomato plants. Because roots will form along the buried stem, it is important that the graft be planted at least 1 inch above the soil line. If planted too deeply, the grafted portion of the plant will root in the soil, defeating the purpose of having a grafted plant. Grafted tomatoes tend to be a bit pricey (we paid almost $16 for one plant including shipping costs). However, if they perform as claimed, perhaps the heftier price is worth it. While we purchased our plants from a mail-order catalog, at least two local nurseries (Fair Oaks Boulevard Nursery and Green Acres Nursery and Supply) carried grafted tomato plants in 2013, which we discovered after placing our order earlier in the year. Several other mail-order companies sell grafted plants but are prohibited from shipping to California. So how did our little experiment go? Throughout the summer, the two plants appeared virtually tied in vigor and fruit set. However, the grafted plant began to decline in late August due to a disease, possibly one of the wilt diseases: fusarium or verticillium wilt (see link below for additional information from UC IPM Online). A lab test would be needed to confirm the disease pathogen, but samples of the diseased plant were not sent to the State Lab. By the time the plants were removed (September 4, 2013), almost half of the foliage on the grafted plant was yellow or brown (dead) without much leaf cover for the fruit; also the cross-section of the lower stem of the grafted plant exhibited signs of one of the wilts (internal browning of the lower stem). 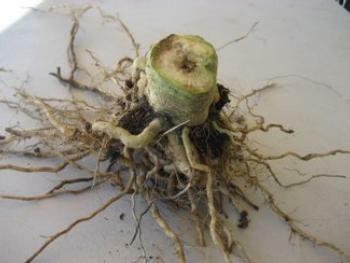 The grafted plant was about 6 to 8 inches taller than the non-grafted plant, but the non-grafted plant showed no signs of any disease (cross-section of lower stem of the non-grafted plant did not have the same discoloration as the grafted plant). Total weight: 55 lbs. 2 oz. Total weight: 47 lbs. 12 oz. Average weight: 10.9 oz. Average weight: 11.75 oz. While the grafted plant produced 16 more tomatoes than the non-grafted plant, the average weights were very close, with the non-grafted tomatoes averaging ever-so-slightly heavier. Our conclusions based on this limited experiment: The additional expense to purchase a grafted tomato on disease-resistant rootstock does not guarantee that the plant will remain disease free. Because the yield was similar and the average weights were close, we are not convinced that the additional hefty expense was worth it. Bear in mind that this was a very small, limited experiment, and results may vary. 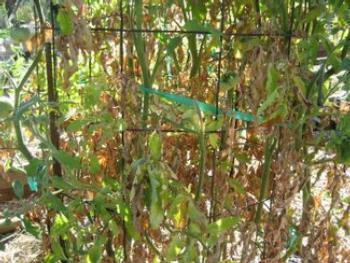 Click to see information about Fusarium wilt and Verticillium wilt from UC IPM Online, UC Statewide Integrated Pest Management Program – Vegetables.